Antares’ efforts to apply their pitch-correction technology to guitar products continues, with this versatile pedal-format processor. 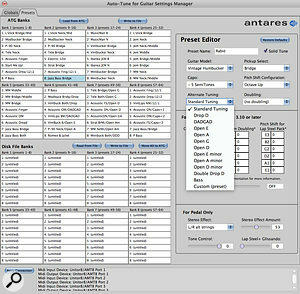 Antares’s ATG‑1 Floor Processor is the pedalboard version of the ATG processor already built into some models of guitar, the advantage here being that as long as you have space to fix a hex pickup, such as a Roland GK-3 (or an alternative from RMC or GraphTech), you can use your own guitar. If you haven’t come across the Auto‑Tune-for-guitar system before, it is in many ways similar in concept to existing products such as the Roland VG series of processors, the Roland VG Strat or the Line 6 Variax. The big difference is that in addition to using modelling to emulate different pickup types and applying the pitch-shifting of individual strings to offer alternative tunings, bass sounds and 12‑string emulations, it also includes Auto‑Tune’s pitch-fixing technology to give your guitar perfect intonation and near-instant retuning. There’s also the option to configure some of the effects in stereo, such as panning the doubled strings in a 12‑string emulation. A global detuning parameter is available for when you encounter that lovely piano that is half a semitone flat relative to concert pitch. If you don’t fancy fixing a hex pickup to your own guitar, there are various models with the pickup system already built in, such as Fender’s Roland Ready Strat and models by Godin, Carvin, and Brian Moore Guitars. I tested the system using my own Roland Ready Strat, which I normally use with a Roland VG99. The ATG‑1 Floor Processor connects to the guitar using a Roland 13-pin cable, which is not provided. Another thing that needs pointing out early on is that the hardware can run different software packs; the Core Pack comes as standard. Up to six optional feature packs can be loaded into the ATG‑1, and any one selected to be used at any time. These packs add features such as auto-harmony, pedal steel emulation and so on. The desired feature pack is selected via the Controls screen, and if you need to change packs during performance, they can also be called up via MIDI. A free Software Manager program handles the installation of additional model packs, and so on. A preset/master Settings Manager program is available free of charge for both Mac OS and Windows to simplify setting the global parameters, and for managing or editing presets. Both programs are based around straightforward ‘form’ style pages where you fill in the necessary boxes or use them to select menu options, though the windows seem to lack scroll bars, which means that on my 13-inch MacBook Pro I can’t access the bottom part of the page as it falls off the bottom of the screen. 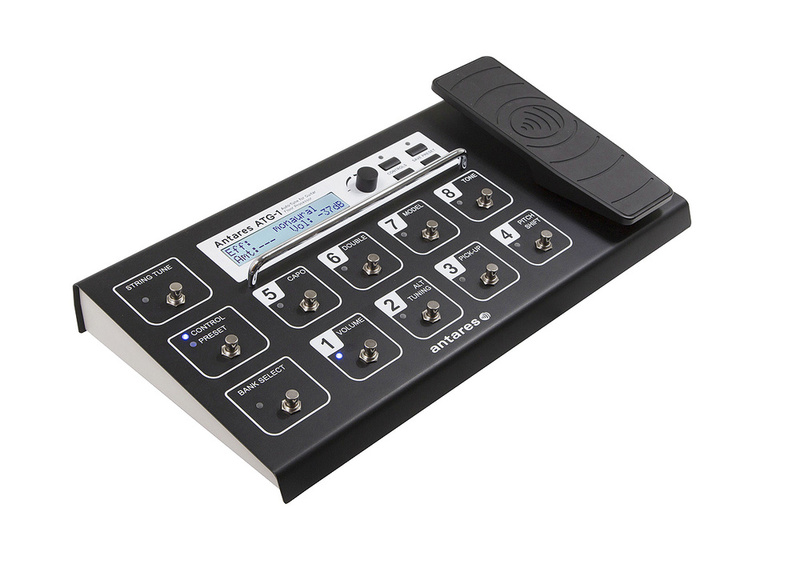 The ATG‑1 uses its MIDI In and Out to converse with the ATG Settings Manager or Software Manager, and for this you’ll need a MIDI interface connected to your computer — the lack of a USB port for this purpose seems somewhat archaic. MIDI may also be used to communicate Program Change and Control Change messages between the ATG‑1 and other MIDI-capable pedals or rack units; pretty much any of the ATG‑1 performance settings can be called up via MIDI. While you are probably familiar with the concept of guitar modelling, and with alternate tunings or virtual capos created using pitch-shifters, the intonation part of the ATG‑1 system is, to the best of my knowledge, unique. Even if your guitar is only nominally in tune, the String-Tune mode brings the output into perfect pitch by applying the necessary pitch-correction. But it doesn’t actually tune the strings themselves — as the Wilkinson or Tronical systems do — it’s all done with pitch-shifting. As long as you play loud enough not to have the acoustic sound of the strings distract you, this works perfectly well. Push and hold the String Tune switch, strum all six guitar strings and ATG‑1 will do its thing. After tuning, the Solid-Tune mode (which can be turned on or off) ensures every note is in tune, compensating for things like poor intonation, but the clever part is that it steps aside if it realises you are bending notes on purpose. For sound shaping, the system can model pickups and pickup combinations. In common with both the Roland and Line 6 instruments, this has nothing to do with sampling, but rather a type of processing that remodels and reshapes the sound coming from the hex pickup. Unlike sample triggering, which usually feels flaky and often incurs a noticeable delay, the ATG‑1 feels just like playing a regular guitar and has a processing time of roughly one millisecond. Alternate tunings and a virtual capo feature are also included, as well as note-doubling effects and a 12‑string emulation. Further controls address pitch-shift, tone and volume, with a number of stereo placement options for the strings and doubled parts. 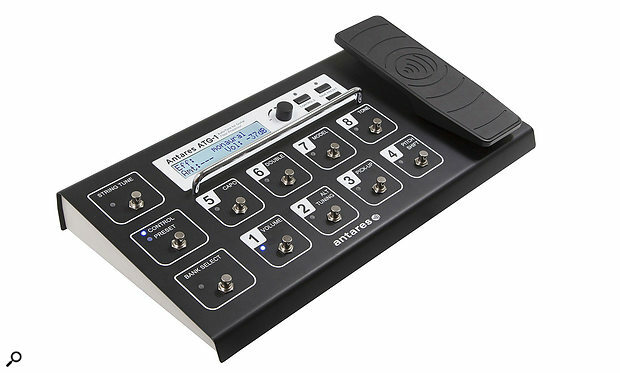 The built-in rocker pedal can be used for a number of functions including controlling volume or pitch-shift for whammy-style effects. The floor unit is a rugged affair built from folded steel with a very readable backlit display and well-spaced switches for the different functions. It is let down somewhat by being powered from a lightweight external power supply with a simple push-fit connector, however there is a plastic cable clip next to the socket to reduce the risk of the plug being pulled out during performance. On top are 11 switches with blue status LEDs, and the eight numbered switches call up different screens such as pickup Model, Pitch, Alt Tunings, Tone, Capo, and so on. Two more switches access the Control or Preset modes for the eight switches, with the String Tune switch at the top left. As with many other pedal systems, the numbered pedals can be set to work in two ways — one to address their named functions and the other to access presets. Engaging the Bank Select switch on the bottom left enables you to select banks one to eight, followed by any preset (again, from one to eight) within that bank. Next to the display is a rotary encoder plus four buttons, two of which are cursor arrow keys. The other two are labelled Save Preset and Controls — you probably don’t need to guess what Save Preset does. The Controls button accesses global features such as the type of hex pickup you are using, and also makes provision for adjusting the sensitivity of each string so that you get an even balance across the strings. You are also asked to enter the exact distance between each bridge saddle and the pickup centre, plus the scale length of your guitar. You can also turn Solid Tune on or off here. You only have to do the guitar setup once but it will optimise string balance, intonation and the accuracy of the modelling. The latest software versions also include an adjustable noise gate to clean things up when feeding high-gain amps or pedals. Expansion packs are selected from within the Control menu. The ATG‑1 features stereo audio outputs (for those who need them), as well as comprehensive MIDI connectivity and a thru output for sending the hexaphonic pickup signal elsewhere. The rear panel has a 13-pin In and 13-pin Thru socket so you can chain to your Roland Guitar synth or VG processor if you need to. There’s also MIDI In, Out and Thru as well as stereo jack outputs for the audio. What you won’t find is a separate output for the regular guitar pickups of a Roland Ready guitar or your own guitar output fed via the jack on a GK pickup, which is an odd omission as that signal is carried down the 13-pin cable along with all the hex pickup and control information. If you want to combine the modelled sound alongside your regular guitar pickups, you’ll need a separate guitar lead feeding a separate amp input. After reading the manual at least once and making any adjustments necessary in the Controls Menu to accommodate your guitar, step one is to explore the String Tune switch where the process is to strum all the open strings, then immediately press and hold the switch. If you didn’t hit all six strings, a message appears to let you know — otherwise, there’s a brief pitch glide sound, then you’re in tune. To access the individual section controls, press the Control/Preset switch so that the Control LED lights up. Step through the options within each section by repeatedly pressing the switch (or by moving the pedal or Data dial). If you are in one of the Capo, Pitch Shift, Alt Tuning, Double or Model sections, holding one of the control buttons down for more than one second returns the value to its default. Where there’s more than one parameter field, you’ll see a flashing underline cursor in the display. The cursor can be moved between fields using the arrow buttons and its value changed using the pedal, encoder dial and/or foot switch. It’s actually more intuitive than it sounds and the options as displayed tend to be very clear. 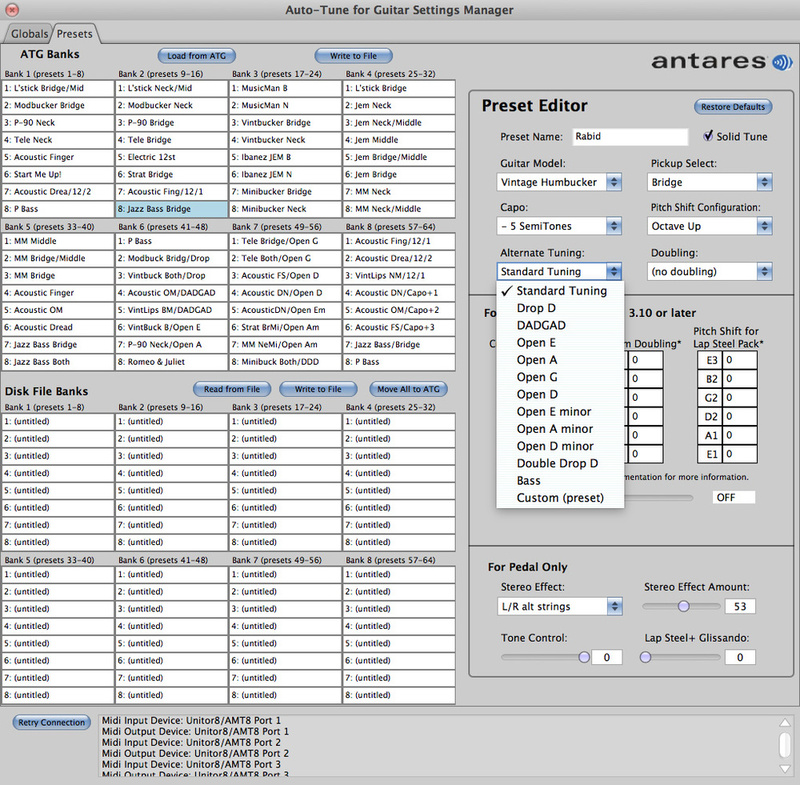 The ATG‑1’s 64 preset memory locations are arranged as eight banks of eight patches, and once the Windows/ Mac editor software becomes available, patches will be able to be created or edited directly from a computer screen. We’re told that it will enable the user to set up custom scales and doublings that are not currently available. In live performance, the ATG‑1 responds to the controls fitted to a GK pickup. Some keyboards allow transposing to be set up by holding a button and then pressing a specific key on the keyboard. The ATG‑1 has the guitar equivalent in the form of Fret Control, which can be used to bring up any of the first 21 presets by fretting different notes. Settings also respond to MIDI Control Change messages, and MIDI pitch-bend over a range of one octave down to one octave up. Tuning the guitar to it’s ‘normal’ tuning is achieved as explained earlier by strumming the open strings, then pressing the String-Tune button. There are alternate tunings that can then be called up and which use pitch-shifting to move each guitar string by the required interval. However, you can also cheat a little to create your own tunings by fretting strings during the tuning process, as the auto-tuning will then add the required pitch offset to make your fretted note sound the open string note for that string. The preset alternates include open major and minor chord tunings as well as a bass emulation, drop D and DADGAD. Version 3.10 onwards of the Model Pack software also caters for custom tuning and doubling modes. The doubling modes include a 12‑string emulation, where the top two added strings play in unison and the bottom four play one octave up. Solid-Tune, when turned on, constantly monitors the pitch of each string. If the actual pitch of a string, after tuning using the Pitch Tuning procedure, is close to a chromatic pitch, then the pitch is nudged exactly to that note. If the pitch falls outside that range, the system assumes you are bending the strings on purpose and leaves you free to do your thing. Solid-Tune works well for players who push down too hard on their strings, causing the notes to go slightly sharp, as it keeps them in perfect tune — ideal for heavy-handed rhythm players. Also, try out some of those ‘up the neck’ chords that sometimes sound a bit off, and you’ll find they are bang in tune too. This is all quite subtle and relies on your tuning not shifting too much, so doing the occasional in-flight ‘strum and tune’ is advised. As you’d expect, the pickup section offers the pickups and combinations that would normally pertain to the model chosen, and includes Strat type, Tele type, P90s, lipsticks and humbucker variations. So for a Strat-type guitar you’d have the usual five pickup options, whereas a Telecaster or Les Paul would have three. There are also acoustic emulations but, as with every acoustic emulation I’ve ever heard, the effect is a little overdone to my ears. Similarly, the 12‑string sound comes over as a touch artificial — it’s OK for live but I wouldn’t use it for serious recording. Being fair I’d say the same of the Roland and Line 6 alternatives in these respects. Earlier I mentioned Fret Control, which uses the guitar’s fretboard as a means to call up certain settings including the first 21 presets. The process is to perform a standard String Tune, and then, while continuing to hold down the button, pick a note strongly and clearly to change a setting. The manual includes a list of which setting changes correspond to which notes. The modelling and alternate tunings/doubling side of the ATG‑1 feels and sounds very similar to what its competitors offer. The different guitar sounds get very close to the guitars they purport to emulate, though the overall response of the guitar feels slightly compressed. This actually makes for a comfortable playing experience, and though die-hards will tell you it isn’t quite the same as the real thing, it still sounds pretty sweet, and there are some great recording sounds to be had as well as catering for covers bands who need to make regular sound changes between songs. There’s nothing radically new up to this point and faking a 12‑string by adding shifted octave and unison strings is also established technology — though it is worth commenting that the quality of pitch-shifting is very high. What sets the ATG‑1 apart from the Rolands and Line 6 Variaxes of this world is the tuning side of the equation, and some of the additional pitch tricks that can be bolted on using optional packs (see box). The Settings Manager software provides comprehensive access to the ATG‑1’s inner workings.Despite the editing software seeming to be rather bland for a company specialising in software, it works perfectly well and I had no trouble getting the MIDI side set up — it really was just ‘plug in and go’. However, I couldn’t see anywhere that displayed the software details of the installed model packs, and not being able to fit the window onto a 13-inch Apple laptop because of the lack of scroll bars just seems sloppy. String-Tune offers an electronic counterpart to motorised tuners with the obvious difference being that the pitch adjustment is electronic and not mechanical. Therefore you need to play loud enough to cover the acoustic sound of the strings as that can be off-putting if the actual string pitch differs from the corrected pitch — and much more distracting if you use a shifted or alternative tuning. Switching on Solid-Tune and playing chords that stay perfectly in tune may come as a revelation to some. The algorithm that tries to decide whether you are intentionally bending strings or not works very well, but if you’re one of these players who like to add very subtle micro-pitch modulations to solo lines while not overtly bending strings, you may find these get ironed out if they fall inside the Solid-Tune correction window. Overall though, this feature works better than I imagined it would and most players should find it feels very natural and transparent. If you’re happy with modelling guitars and the tricks they can perform, then the additional tuning capabilities of the ATG‑1 are very appealing. The down side, as with any of these devices, is that the modelled guitar sounds, though they sound very close to the real thing from an audience perspective, may not feel quite the same and may lack the subtle tonal complexities of the original. That said, when I took on this review I was expecting the ATG‑1 to be predominantly a live performance tool, and though it wouldn’t replace my usual collection of guitars in the studio, there are recording tasks to which the ATG‑1 is perfectly suited. And if you play in a band that needs to switch between a lot of different guitar sounds and alternate tunings, the ATG‑1 could have been designed just for you. While the Solid-Tune feature is unique to Antares, similar modelling and alternative tuning capabilities are provided by Roland’s VG-series processors and the Line 6 Variax guitar range. Roland’s VG processors also allow you to use your own guitar if fitted with a hex pickup. The optional Lap Steel+ application is essentially the same as the Core Pack but with an additional Glissando parameter and further pitch-shift options that include the ability to assign different pitch-shifts for each string to the pedal. The simplest application is to assign a 200 cents shift to the B string, which gives you a classic B bender operated by the pedal, though you can set up multiple string shifts, to a maximum of 1250 cents per string. The pedal remains in pitch-bending mode unless needed for other controls such as Capo, and as you change presets, the pedal always defaults to pitch-shift. Glissando, also in the Controls menu, can add auto pitch glides of up to 10 seconds in duration when you change between presets that employ different alternative tuning settings, so if you get really clever, you can integrate these changes into a pedal-steel-like performance where you can set different glide rate for each preset. Pitch-shifting is one of the most difficult effects to get right, but having it applied to individual strings sounds pretty smooth here and is free of obvious warbling artifacts. Very effective tuning and pitch-correction technology. Useful range of guitar sounds without the options getting too complex. No USB port for editors or software updates. No ‘straight’ guitar feed-through connection. Editing software may not display correctly on smaller laptop screens. The ATG-1 allows you to use your own guitar as long as it is equipped with a compatible hex pickup, and it offers all the expected modelling advantages of alternate guitar sounds and tunings plus Antares’ specific tuning technology.